We visited Cherry Hill this summer for the very first time, and we had a wonderful time. There was so much to do for the whole family, but we loved how it focused on younger kids. 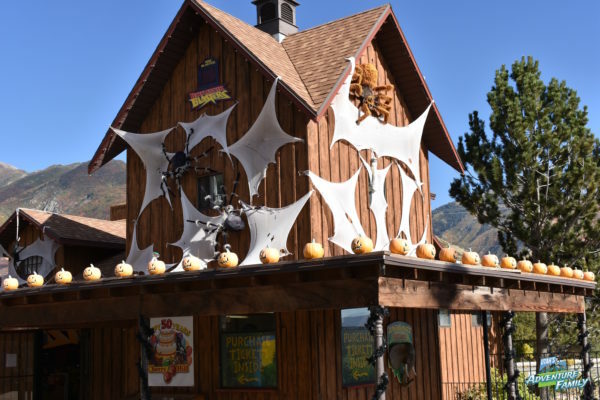 Now they have a fun, family-friendly Halloween event, Scary Hill, opening on September 29, and running through October 30. We were so excited to check it out! Scary Hill is a little smaller than the normal Cherry Hill since all of the water toys are turned off for the season. There are still a lot of fun activities, though. 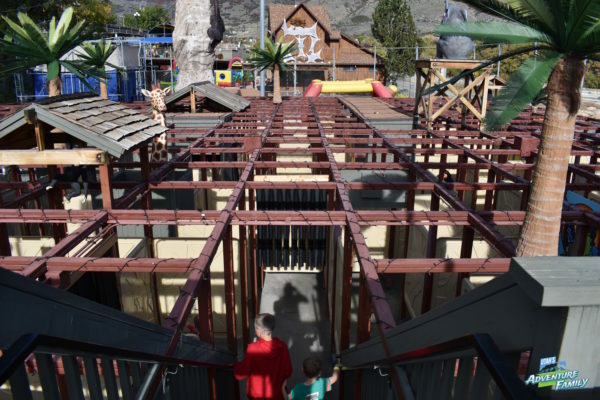 We began our visit to Scary Hill with a family battle in the Battlestar Blasters. 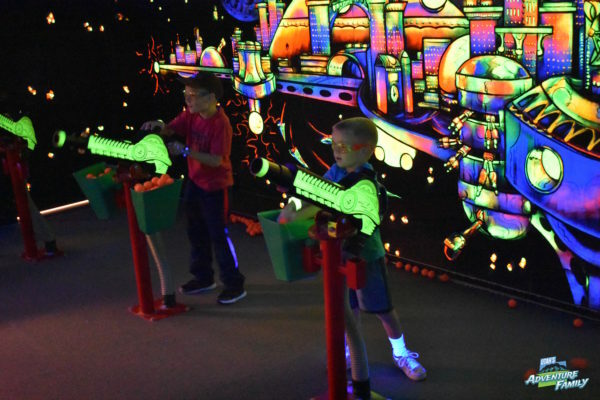 We love this fun black light room where you shoot soft balls at one another, and try to score points by shooting at the target. We always leave giggling. We went through the maze that has been turned "scary" with some Halloween images throughout the maze. We really liked when we ran into some photo ops and were able to take silly pictures right in the maze. This maze is great for young kids because you can't get lost for too long, and none of the Halloween paintings were scary. There were "spooky" pictures like this all through the maze. 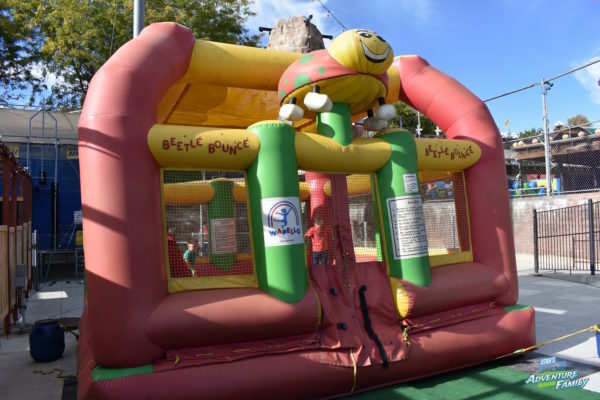 They have some fun bounce houses set up for kids to jump in or make their way through the obstacle course. These are located by the climbing wall and the trampoline jump, so we spent a good chunk of time there. Our boys love these type of activities. Our 5 year old had quite the time climbing up to the top to slide down. 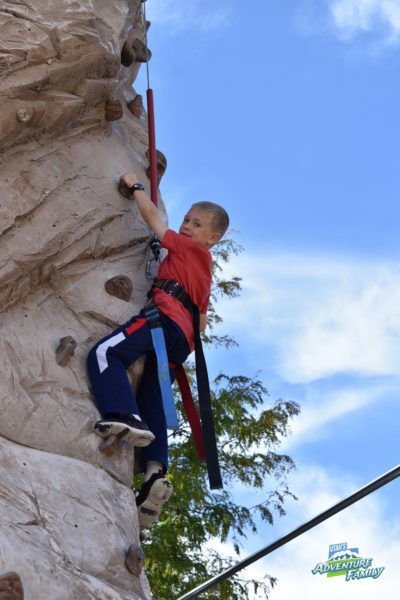 We always have to climb the climbing wall when we visit Cherry Hill. 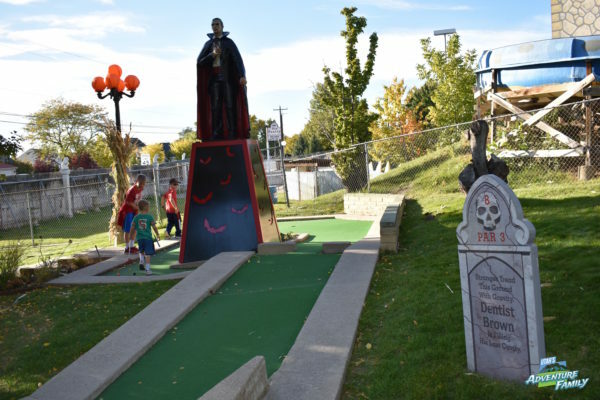 The mini golf course was all decked out in Halloween gear, too. 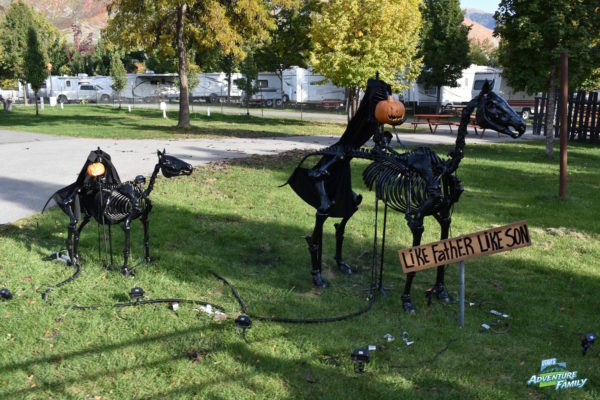 There are some great Halloween decorations at most of the holes. We laughed at all the headstones set up along the golf course. We enjoyed the golf course in the summer, but it was just as fun in the Fall. 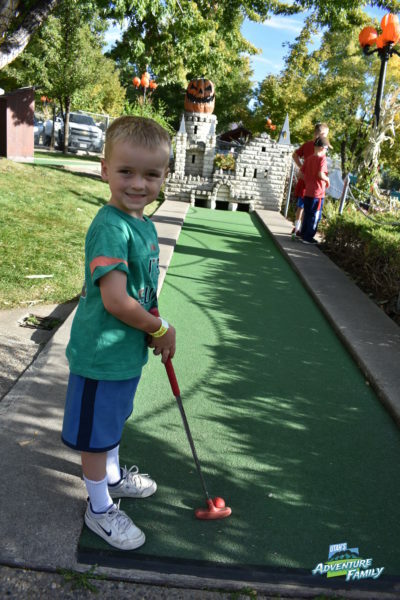 And we love that this course is simple and fun for all ages. 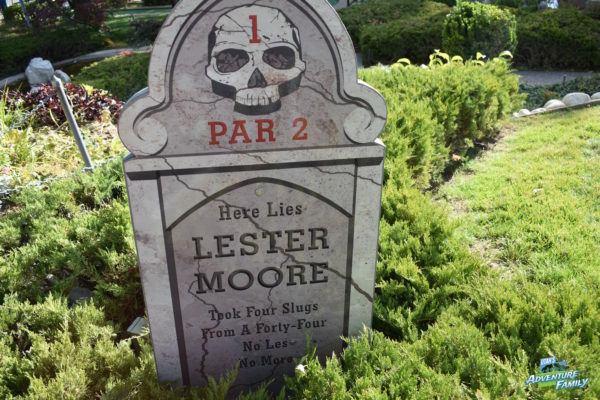 Each hole had a silly tombstone to read. There were all sorts of different decorations. 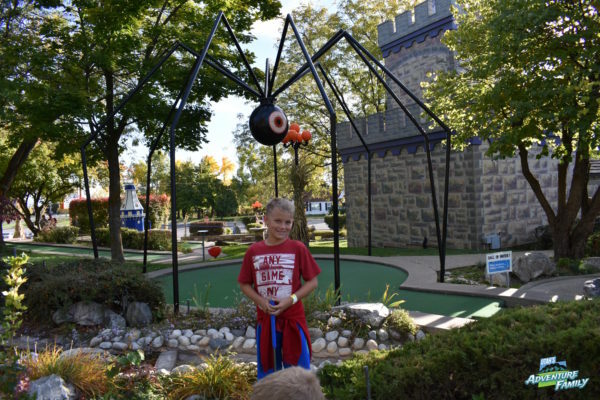 This one-eyed spider was our favorite. The highlight of Scary Hill is the tractor ride through the Boneyard. There are skeletons everywhere dressed as all sorts of things. We saw pirates, superheroes, Star Wars characters, Teenage Mutant Ninja Turtles, mad scientists, and much more. We had a blast looking at the displays, and we even took a second ride on the tractor ride so we could sit on a different side and see different skeletons. There was Halloween music playing and our boys loved this part of the day. We were there during daylight, but we have heard it's really fun at night with everything lit up. We couldn't stay until it got dark, but you might want to plan your visit accordingly. 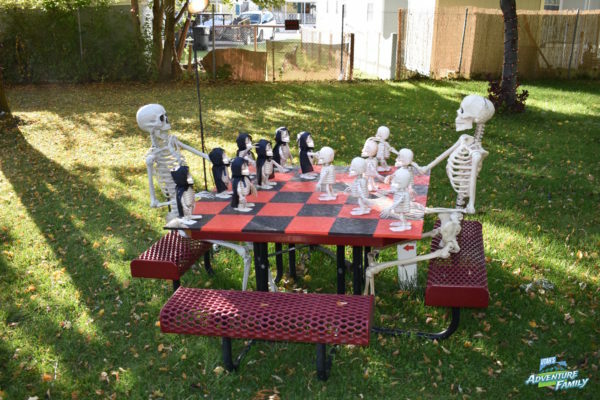 We loved these skeletons playing chess with skeleton chess pieces. So fun! 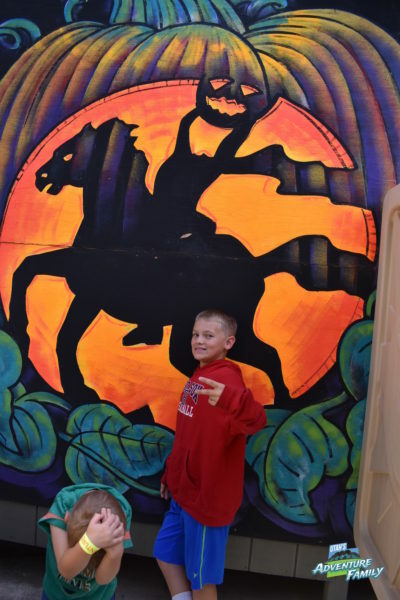 Mom loved the Headless Horseman and son duo! 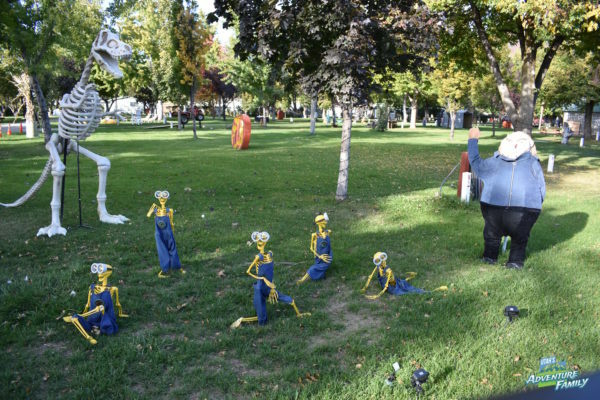 We were excited to see some minions. 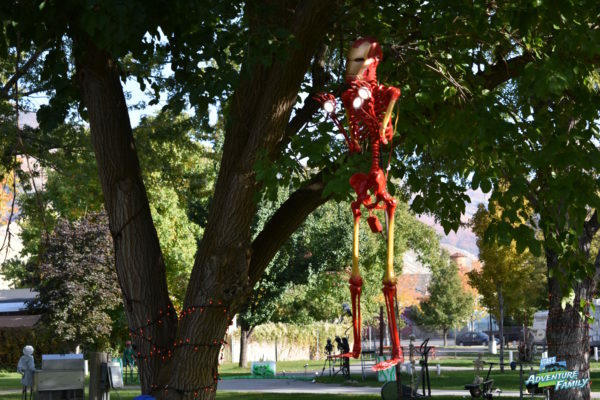 Ironman was hanging from a tree! 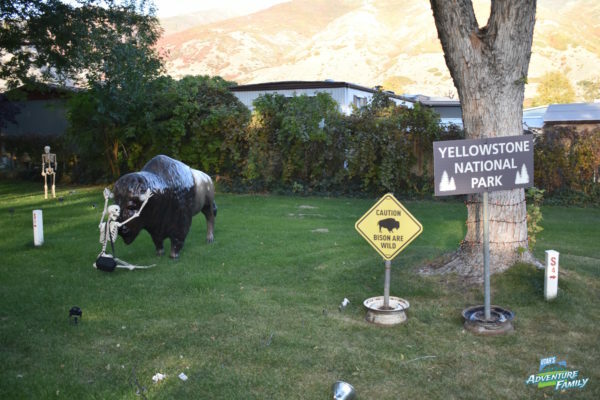 Everyone loved this display since we love Yellowstone so much! [/caption] There were a few things that we loved about Scary Hill. First, we loved that it wasn't very crowded. We were there on a Saturday afternoon/evening, and we didn't have to wait in any lines. 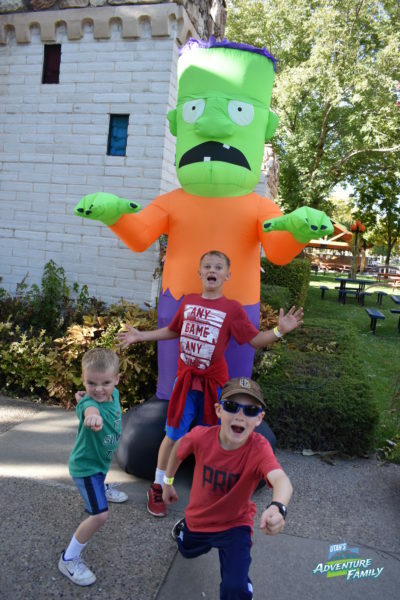 Second, everything was very family friendly, but our boys through it was so cool to go to "Scary Hill." Third, you can do all of these activities for one low price of $9.99/person. You get all these fun activities and you can do them as many times as you want. Kids 3 & 4 are $4.99, and 2 and under are free. 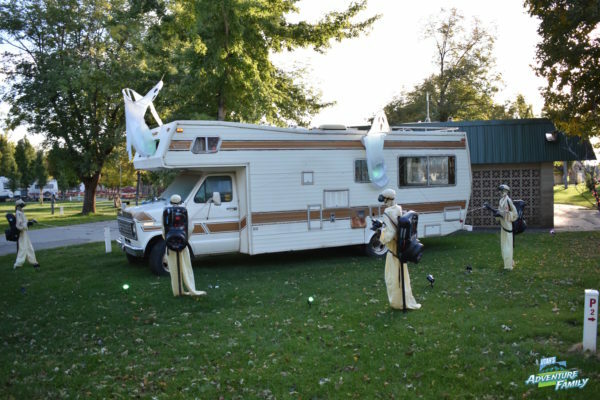 It was a great Halloween family outing. 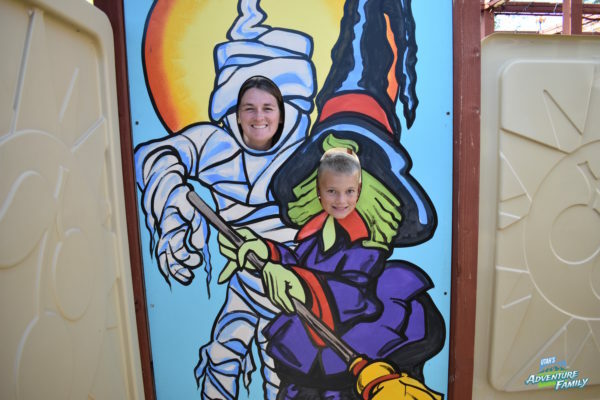 We had a blast at Scary Hill. 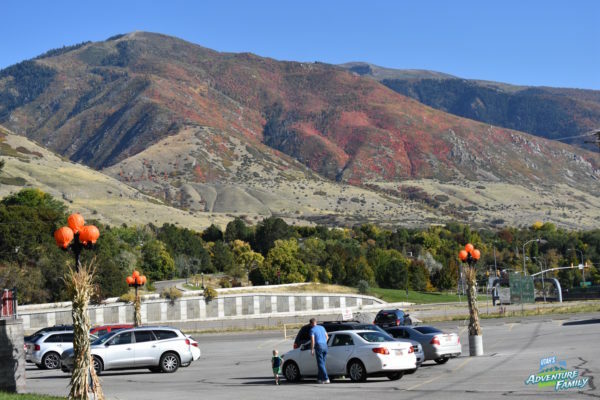 And the Fall Foliage on the mountains was amazing. 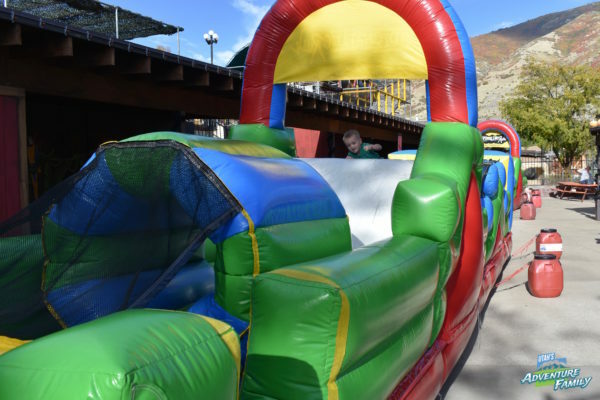 Scary Hill runs from September 29 - October 30. It is open Weekdays 5-9 PM, Saturdays 11 AM - 10 PM. Closed Sundays and Halloween Day. Our Epic Day at Cherry Hill Resort! 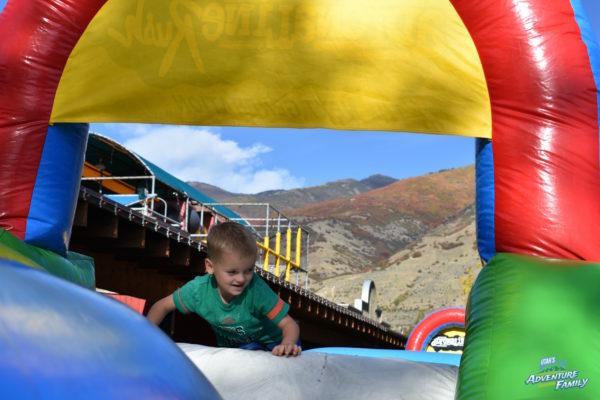 Cherry Hill: Utah's Best Water Park!